For the past five years Isabel has been living in New York, Paris and London and now she is back in Marbella, which has always been her summer home. 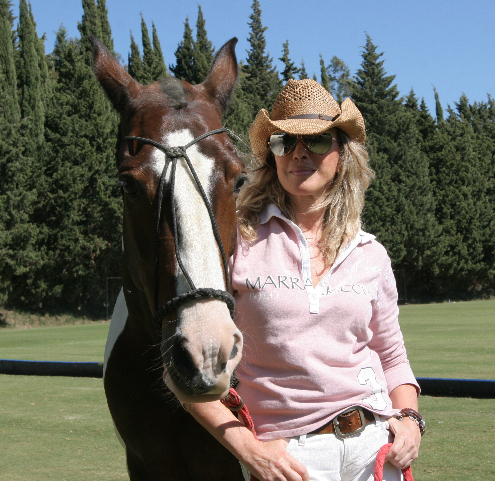 Isabel is a well-known designer and interior decorator and she is the only female polo player in Costa del Sol. There isn't a thing that this woman can't do. Isabel has been a muse to Ferre in Paris, had her own TV show in New York and she has decorated five villas and redecorated over 40 rooms in the Marbella Club Hotel. Isabel also decorated the famous grill restaurant at the Marbella Club and three houses at the Marbella Hill Club. Her work has been published in magazines Casa de Campo and el Mueble and she recently finished decorating a house in Sotogrande El Cortijos. At the moment she is working on her new fashion line for polo. Isabel is also the only female polo player on the Costa del Sol and her team "Los Coyotes" won the Andalucian Championship in 2007. Unfortunately she broke her shoulder in 2008 but was back playing the following year with the Dr. A team. Isabel hopes to play this season as well, if time and work committments allow! this year. Isabel de Borbon also attended Stephen Webster's party last week and she is also a huge fan of his work. For Isabel, Stephen's designs are very rare and different from others. She was happy to be at the party for another reason as well. The singer, Bryan Ferry, who performed at the event is a good friend of hers back from the London times. This summer Isabel is planning to attend the Villa Padierna Ferragamo Cocktail Party and also the Concordia Gala dinner on August 4.